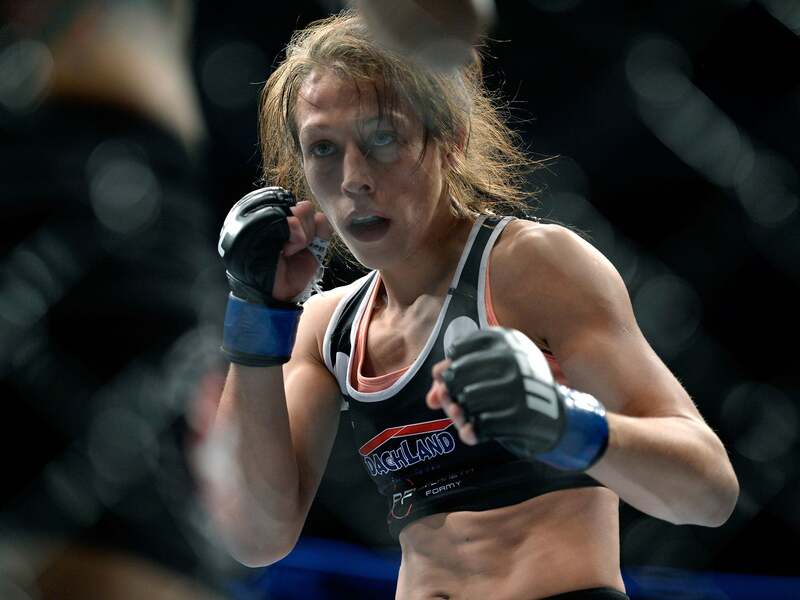 Joanna Champion 6.0: Who's Next? Discussion in 'Archives' started by NinjaNiK, Aug 14, 2016. With Karolina Kowalkiewicz beating Rose Namajunas (29-28 via Split Decision) at UFC 201, and then being moved up the UFC's strawweight rankings to the #2 in the division, it had appeared that the writing was on the wall as far who Joanna Jedrzejczyk's next opponent would be .. However, in absence of any official bout announcement since that time, one has to wonder if the UFC is waiting for the outcome of Jessica Andrade vs JoJo Calderwood at UFC 203 on September 10, 2016 before the final determination is made for who will be getting the next TS against Joanna Champion. Karolina Kowalkiewicz aka KK, is the former KSW Flyweight Champion (a Polish MMA org), and she is on a 3 fight win streak since debuting in the UFC against Randa Markos. In her last Octagon appearance, KK was able to rally back against Thug Rose after a slow start in Rd 1 which lead to her getting picked apart by Thug Rose on the outside. However, KK's strength and skill in the clinch was ultimately too much for Rose, and she bested Thug Rose on the ground as well..
JoJo Calderwood had a very impressive performance against Valerie Letourneou when the two recently met in a catchweight bout at 125lbs .. But there are still questions as to whether JoJo's apparent improvements will hold up once she is back at 115, where she will soon face the formidable Jessica Andrade ..
Jessica Andrade, who formerly fought at Bantamweight in the UFC, made her Strawweight debut against former Invicta Champ Jessica Penne and put on a Wanderlei Silva style showcase with her constant barrage of hooks to the head and body of Jessica Penne .. So ... it looks as though we may very well have to wait until after September 10th to find out who's head will be taken next. Shamrocker, TGArthur, gorgonon and 26 others like this. BC, deviake, CarlC and 2 others like this. BC, TrainInVain and NinjaNiK like this. I'd like to see Valentina and her meet at 120-125.
deweydeucalion, DevNull69, Heelhook71 and 4 others like this. Shamrocker, NightwingBJJ, BC and 6 others like this. gosuasus, deweydeucalion, BC and 4 others like this. deweydeucalion, politozx7r, Anung Un Rama and 10 others like this. Why September 10th? 203 of course, but they have announced any press conference? The Great Macsby, BC, WinZip and 4 others like this. BubbaH, The Great Macsby, Anung Un Rama and 7 others like this. Anung Un Rama, BC, Eater of Souls and 2 others like this. ps. KK is next. And gets destroyed. The Great Macsby, BC, TrainInVain and 1 other person like this. BC, DonCarlos, TrainInVain and 2 others like this. BC, Eater of Souls, Jackonfire and 3 others like this. Some good fights to make over the next 18 months: Calderwood, Suarez, Grasso - depending on these girls continuing to win of course; and Shevchenko if they start a 125 division. I do think we're 2 or 3 fights from Joanna retiring though, especially if there's no 125 division. BC, Eater of Souls, TrainInVain and 1 other person like this. These tend to go 500 pages it seems like. I just want to be in the first page damn it. Haaa. I don't know or care who Joanna Champion fights next but I will be rooting for her. Dana_is_your_GOD, Anung Un Rama, BC and 5 others like this. Tatiana Suarez has a fight booked now? BC, Eater of Souls, Jackonfire and 1 other person like this. My God, can she be anymore BASED?!? Dana_is_your_GOD, BC, Eater of Souls and 4 others like this. Oh yeah. I googled 203 date, but i did not looked at the card. Anyway - somehow i doubt that UFC gonna do something else than JJ vs. KK. It's too good to not do this. BC and TrainInVain like this. misTerK1, BC, MrDoctor and 4 others like this.